To make identifying these guys easier, the Predator from the first movie is referred to as the Jungle Hunter and the Predator from the second movie is referred to as the City Hunter. 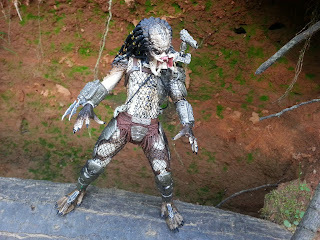 The Predators measure in at just a little over 8 inches each, which puts them perfectly in the typical 7 inch scale NECA uses for their movie figures. 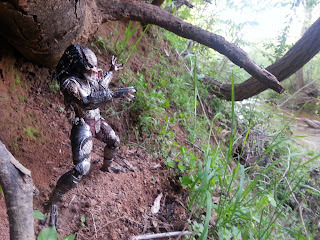 Considering that the actor who played the Predator, the late Kevin Peter Hall, was 7 ft 2, then both Predators are in scale with other NECA movie figures. 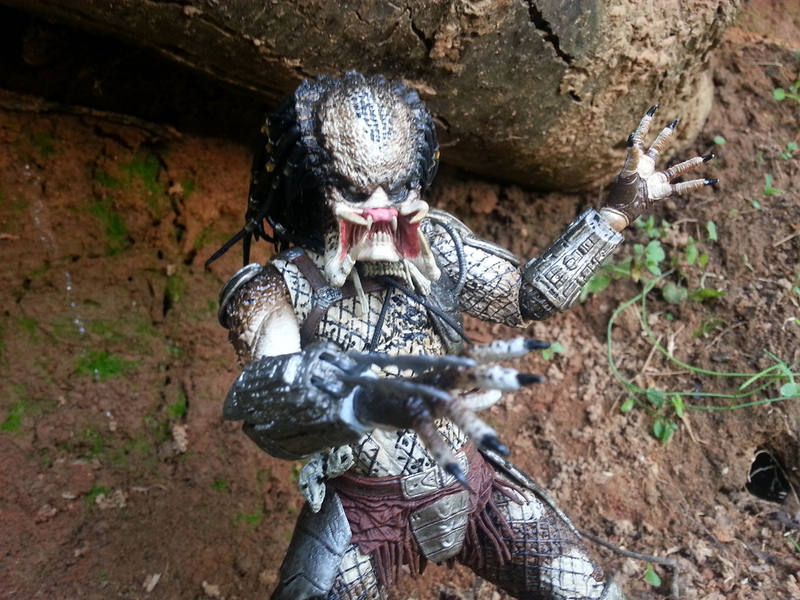 While these figures are variations of figures previously released in the Predator line, they're completely different from one another in sculpt with no shared tooling that I can tell. The Jungle Hunter is unmasked and has a little bit of green blood on his right calf from prior to the final confrontation of the film. The City Hunter Predator comes specifically from the scene after the fight with Gary Busey and Danny Glover in the freezer, as he's wearing the smaller rebreather mask and has scattered gunshot wounds and a severed arm. 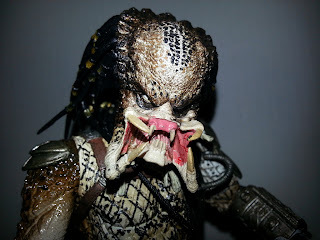 Fun Predator Fact #1: The actor who played the Predator in both Predator and Predator 2, the late Kevin Peter Hall, also played Harry in Harry and the Hendersons and Gorvil in Mazes & Monsters! Both figures are highly articulated, allowing you to put them in plenty of excellent poses. Each figure includes: ball jointed ankles, double hinged knees, ball jointed hips, ball jointed shoulders, ball jointed elbows, ball jointed wrists, extendable wrist blades, and ball jointed heads. Jungle Hunter has a swivel waist while City Hunter has a ball jointed waist and a ball jointed plasma cannon that slides on a track on his left shoulder. If there's any natural, normal pose you can't get these guys into, I'd love to see it: the articulation is really well done with tight, durable joints all around. Not only that, but due to the various knee pads, wrist gauntlets, and other accoutrements, most of the articulation is well hidden and integrated naturally into the figures. 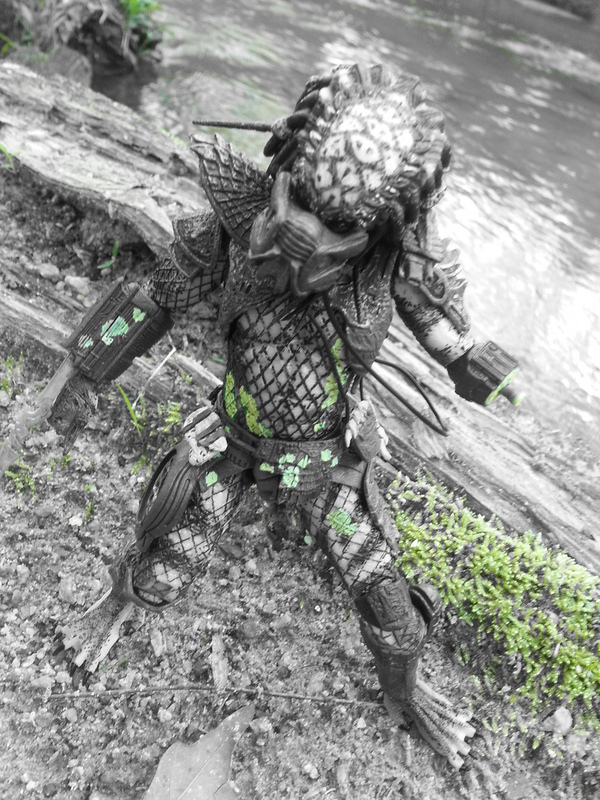 Fun Predator Fact #2: Jean-Claude Van Damme was originally cast to play the Predator, but was removed from the film early on for various reasons. 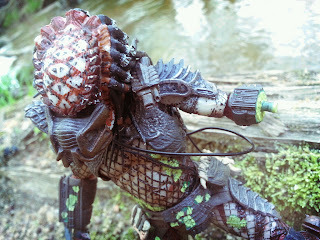 Both figures feature excellent sculpts, but I'll look at the Jungle Hunter first. I'll start with the obvious and say that the head sculpt is nothing short of amazing. All the little ridges on the forehead, the teeth and mandibles, the somewhat beady and sunken in eyes, it's all here. 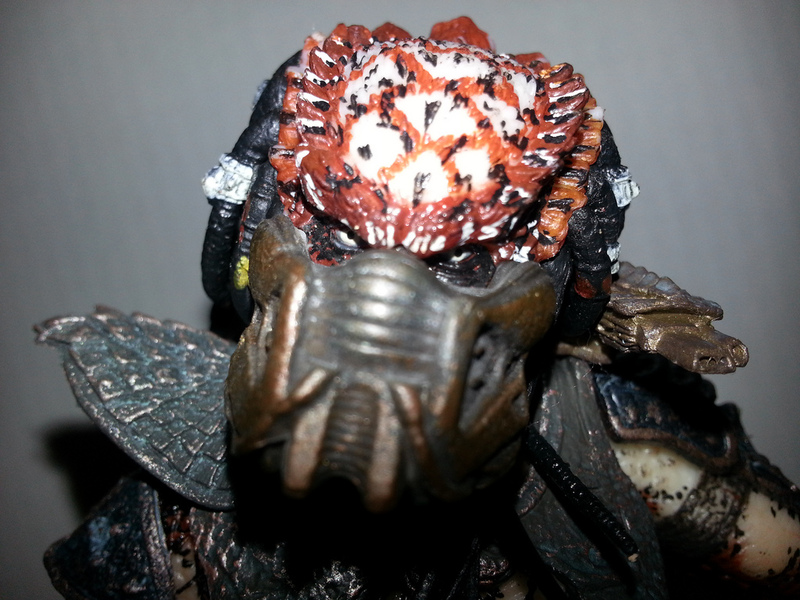 NECA wisely chose to use a softer, more rubber like material on the dreadlocks, which gives them a nice, naturally flowing appearance. The body sculpt is quite good, too. 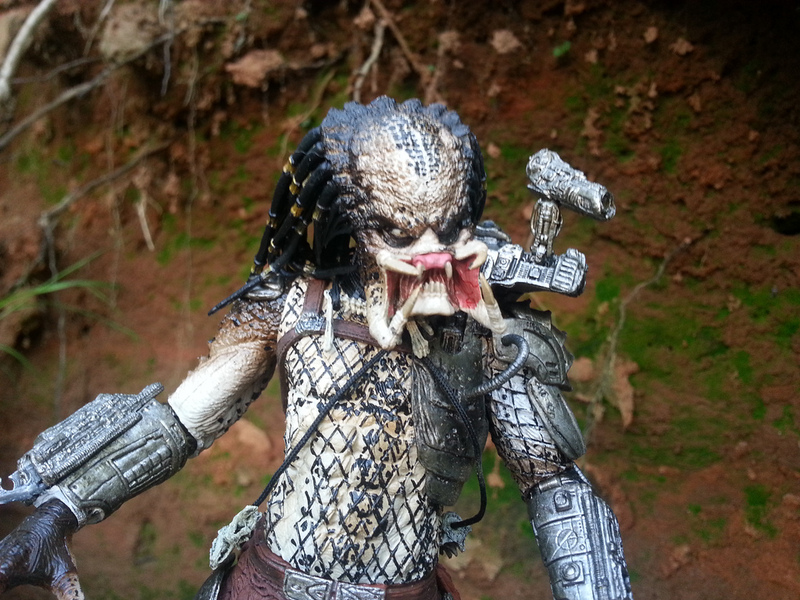 Not only is it appropriately muscled, but it's covered with the sculpted netting that the Predators wear. The armored pieces are all appropriately techy while still looking spartan and functional. 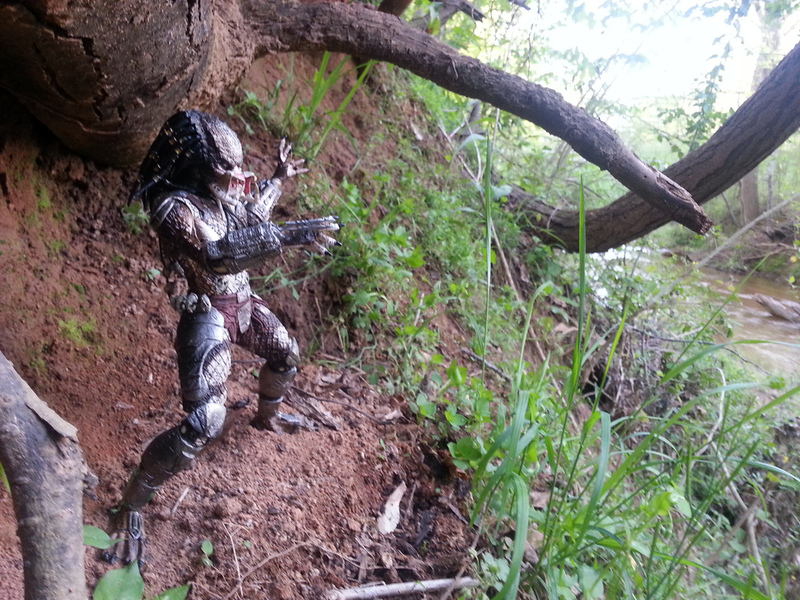 The figure uses lots of separately molded pieces added on over the sculpt such as the Predator's chest and shoulder armor and backpack, which are held on by a sternum strap. Jungle Hunter's loincloth is also made of a softer material and features additional armored bits (you never can be too careful!) as well as a belt buckle with a symmetrical design. There are two strands of trophies hanging across the Jungle Hunter's torso; they're actual pieces of cord with various sculpted skulls and vertebrae on them. Last, but not least, the hands and feet are incredibly wicked. The nails are actually really sharp, so be careful!  in the film as tech expert Rick Hawkins. The City Hunter's mouth is covered by the rebreather mask (it has a soft, flexible cord that attaches to his backpack), but you can easily see that the ridges are much more pronounced on this figure's forehead than on the Jungle Hunter's. His eyes are very sunk in, almost to the point where they are hard to see. His dreadlocks are made of the same soft material as the Jungle Hunter's, but they feature more adornments in the braids. While the musculature of the Jungle Hunter's body is more ridged and sharp, the City Hunter's muscles seem smoother. 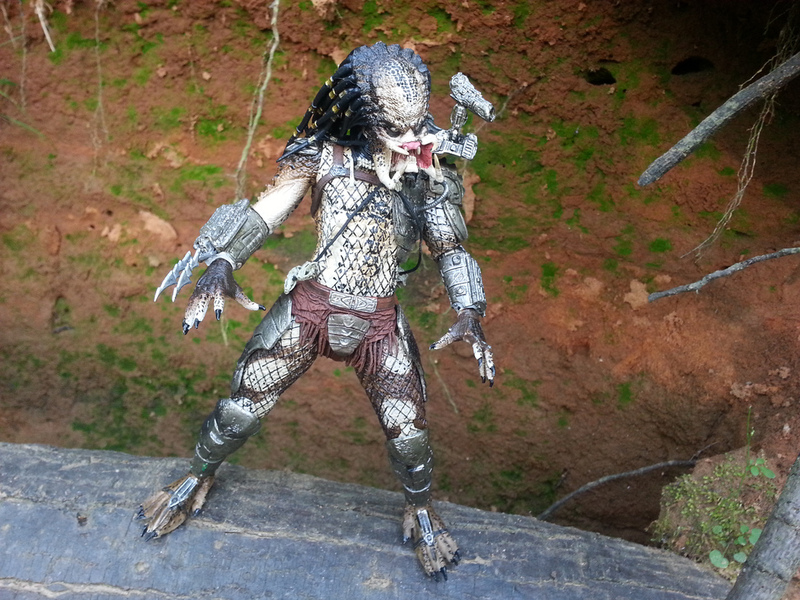 He also has netting sculpted over his torso, but his netting has wider spacing. 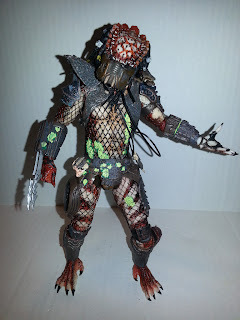 Since it seems that the Predator's cobble their armor together from different eras, it makes sense that some of the City Hunter's armor feels futuristic while other pieces appear decidedly primitive. The leg armor not only looks ancient, but it has sculpted scuffs and dings in it, especially on the knee pads. 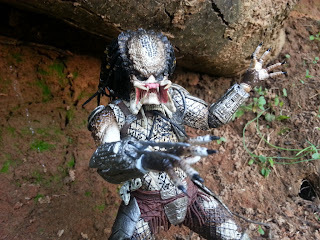 The wrist gauntlets are more hi-tech and feature the wicked extending blades which the Predator uses for silent kills when getting up close and personal with his prey. The separately molded pieces of the figure are really nice, especially the detailed series of waist adornments, the satchel, and the articulated plasma cannon. It's not removable, but it does move up around. One last detail: notice on the City Hunter's back that he's carrying the first aid kit he uses to patch himself up after losing his arm to Harrigan. Fun Predator Fact #4: James Cameron proposed the idea of the Predator' having mandibles to special effects guru Stan Winston while on a plane ride. Rest assured that despite the mind boggling amount of fine details on these guys, the paint work manages to keep up for the most part. While I certainly recognize it must have been a daunting task, the paint on the netting on the Jungle Predator isn't perfect and has gaps. This isn't the case with the City Hunter, however; his paint is flawless. 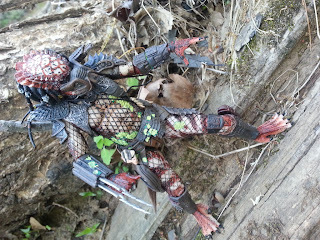 Other than the gaps in the netting, Jungle Hunter is epic, too. The skin tones, the metallic finishes on the bits and bobs of armor, and the splotches of green blood are just exceptionally well done. You really just have to have these figures in hand to appreciate them, although they look good in pictures, too. If there's a weakness for these Predators, though, it might be in the accessory department. Not really a weakness, perhaps, or even an "allergy". Perhaps just a sensitivity. Anyways, I'll list what the package credits the figures with having. 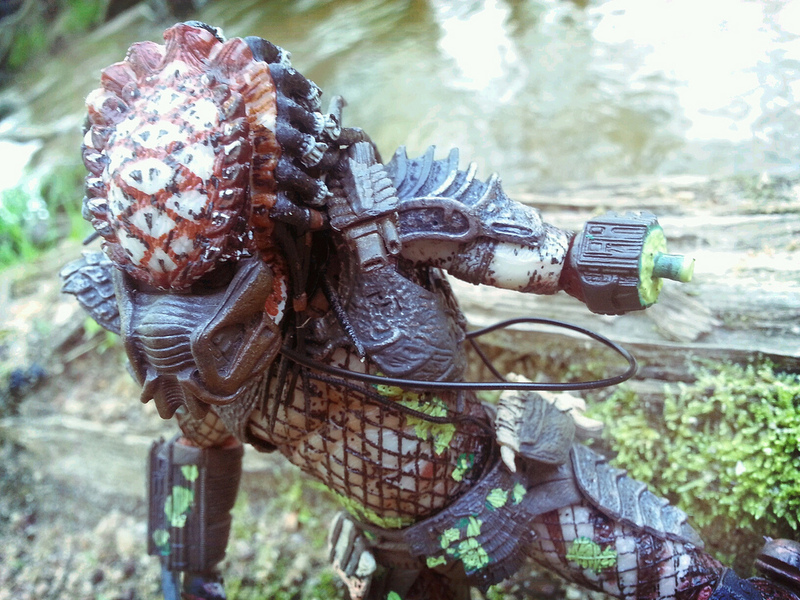 Jungle Hunter is listed as having a "removable backpack & extendable wrist blades." Not bad. The backpack is insanely detailed, snaps on fairly easily, and features a plasma cannon with a ball jointed and hinged arm. The wrist blades are non removable, but are wicked and gruesome. They seem brittle, however, so be careful. They slide in and out tightly enough that you don't have to worry about them sliding in and out unless you want them to. City Hunter has more of a problem with this, however. His arms slide in and out far too easily. City Hunter is listed as coming with: "trophy skulls, smart disc, & extendable blades." 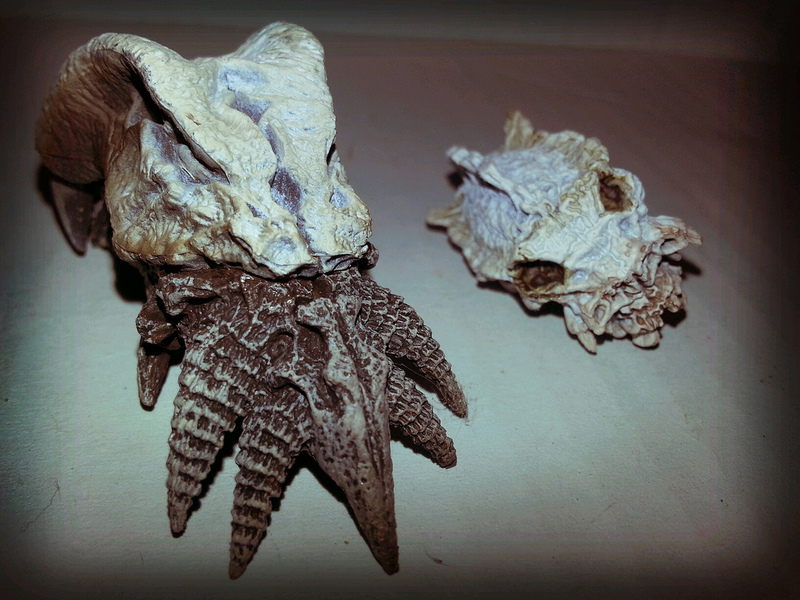 We've already talked about the blades, so let's look at the skulls first. 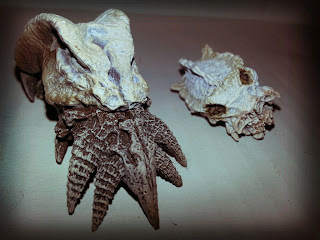 He comes with two of them: the giant fanged skull with a massive under bite and a smaller skull with some type of crest on it's head. They're really nice props and will go great with the display wall diorama that NECA is planning on releasing this summer. And about that smart disc, the wicked cool weapon that the City Hunter uses to kill Gary Busey and that Danny Glover lops off the Predator's arm with? Umm, it isn't in the package. Turns out, no one received it. Look on the City Hunter's hip. It's a sculpted on piece and we see it in the holster, but we don't actually receive it as a separate accessory. While I like the accessories these guys came with, I will say this is an area where the McFarlane figure has this figure beat. The McFarlane City Hunter came with the first aid kit, medical tool, medicine dish, the antique pistol, and the disk. I guess I'll probably display those accessories with this guy. Well, I probably won't, because I like to keep my stuff together, but it's a thought for those who may want to do that. Anyways, I do wish we'd received the disk, and perhaps the spear as well. Does the severed arm count as an accessory? The City Hunter's left arm is removable below the elbow and features some nice green blood, although they chose to put the peg on the stump instead of on the lost appendage. Weird decision, I guess. Fun Predator Fact #7: Shooting of the film was halted multiple times, once so Arnold Schwarzenegger could get married. When someone tells Barbecue17 to get to the chopper, he goes! When you someone tells you to check out Barbecue17's Flickr account, you should go to. Do it! Do it now!! I've read that some people have contacted NECA and gotten a replacement disc since it wasn't included in the package. I haven't bought this two pack, but you may want to try and see if NECA will send you one.